On Monday, the 27th of March, the MD General Assembly gave final approval to legislation permanently banning gas fracking in MD. The bill now moves to the governor's desk for signature. Given that it was support from Gov Hogan (under intense public pressure) that got the bill moving in the Senate, the governor is expected to sign the bill into law. This will make MD the 3rd state to ban fracking, in direct defiance of Trump's pro fossil fuel agenda. Read more about The Shortwave Report 03/31/17 Listen Globally! 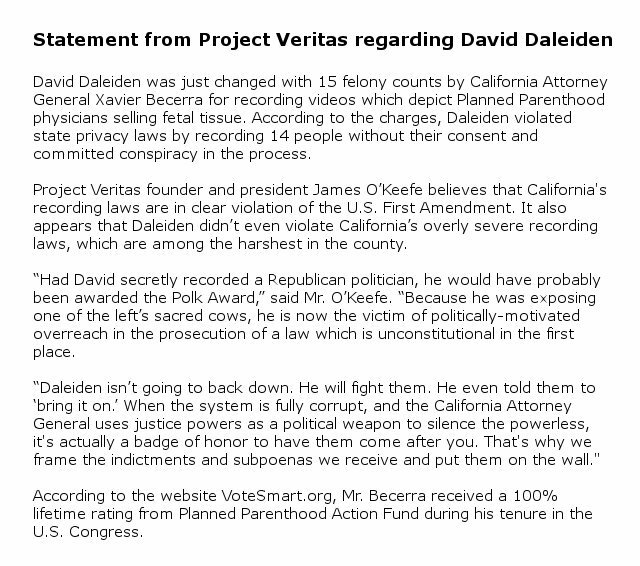 Two undercover videographers from O'Keefe's Project Veritas have been charged in California with 15 felonies for violating the state's strict two-party consent rule for wiretapping in their video sting against Planned Parenthood. Project Veritas released a whiny statement condemning the law itself, but they can "tell it to the judge." On the 28th of March, Trump signed an executive order killing outright the EPA's "Clean Power Plan" to limit CO2 emissions from electrical utilities. The same order ends a moratorium on new Federal lands coal leases, and weakens restrictions on fracking on Federal lands. 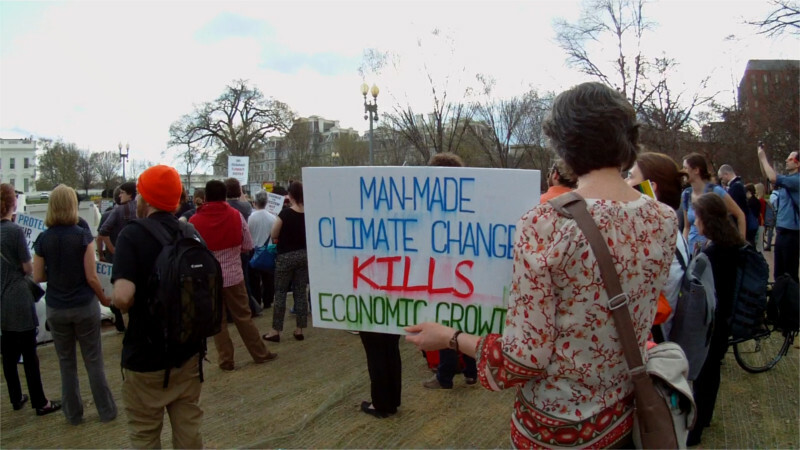 The Sierra Club, Mom's Clean Air Force, and People's Climate Movement protested in front of the White House against what amounts to a War on the Climate by Trump. Update:Norway’s DNB Bank dumps Dakota Access Pipeline. On the 28th of March, Energy Transfer Partners LLP loaded oil into the section of the Dakota Access pipeline under Lake Oahe. They are preparing to put the finished pipeline into service, no doubt delayed by repairs to last week's sabotage damage. The Standing Rock Sioux are not done fighting either: they are seeking court decisions to halt the flow of oil under the Missouri River and protect their water from contamination. 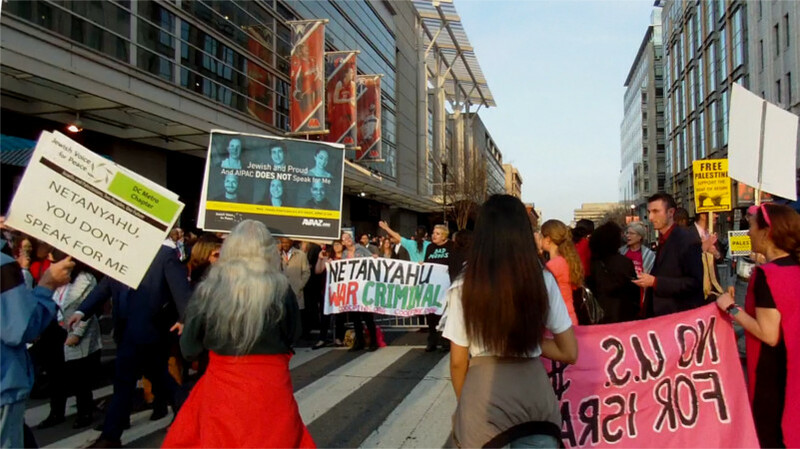 On the 27th of March, at least three different actions were carried out against the AIPAC dinner gala at the Verizon Center. IfNotNow projected an image beginning at around sunset while Code Pink, Avaaz, and others set up on F st where most of the AIPAC delegates had to go to enter. Still another group set up alongside the arena on 7th st about a block further north. On the 21st of March, RT Today reported that two sections of the partially-built Dakota Access pipeline had been disabled by warriors who appeared to be using cutting torches. In one place a hole was cut in the pipe, and a safety valve was melted down in another location. Energy Transfer Partners is whining about "coordinated physical attacks" as direct action ramps up. 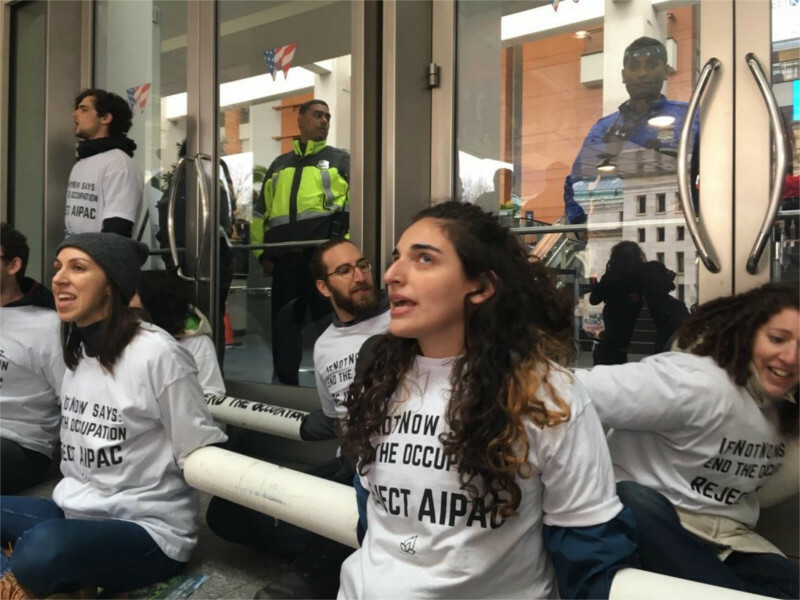 On the 26th of march, the progressive Jewish organization IfNotNow charged the doors of the Washington Convention Center and locked down to blockade both entrances to AIPAC's annual convention. The blockades did not last all day, but the protests did, even after JDL counterprotesters assaulted some of the activists on the scene. Both Jewish and Palestinan protesters stayed put to oppose AIPAC essentially the entire day. 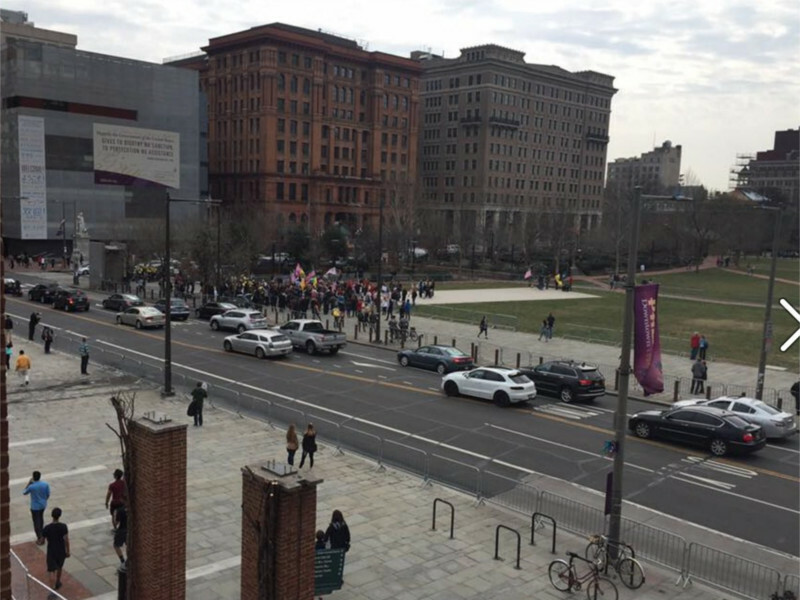 On the 25th of march, a MAGA(pro-Trump) march and rally drew a tiny turnout including known neo-Nazis. It was quickly confronted by masked-up antifascist activists who police allege set off smoke bombs. The outnumbered and outmatched Trumpers and fascists reportedly cancelled their rally "in fear of violence" and attempted to salvage their day with a march. A "blue lives matter" racist, pro-police website reported the rally cancelled, twitter reports show opposing marchers in the streets, ending with "MAGA march attempting to re-form. 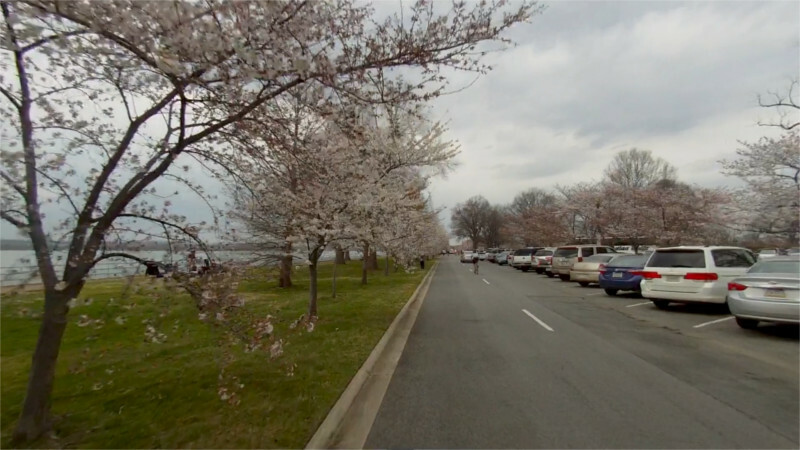 On the 24th of March, the DC Council held a public hearing on whether or not to confirm acting police chief Newsham. A "Mock Bloc" blocked 14th st outside after chalking warnings about Newsham's domestic abuse history and related gender issues in front of the Wilson Building. Some protesters inside the hearing partially hog tied each other as a reminder of Newsham's role in the 2002 Pershing Park mass arrests, and were eventually dragged out by cops saying they were being taken to trash cans. 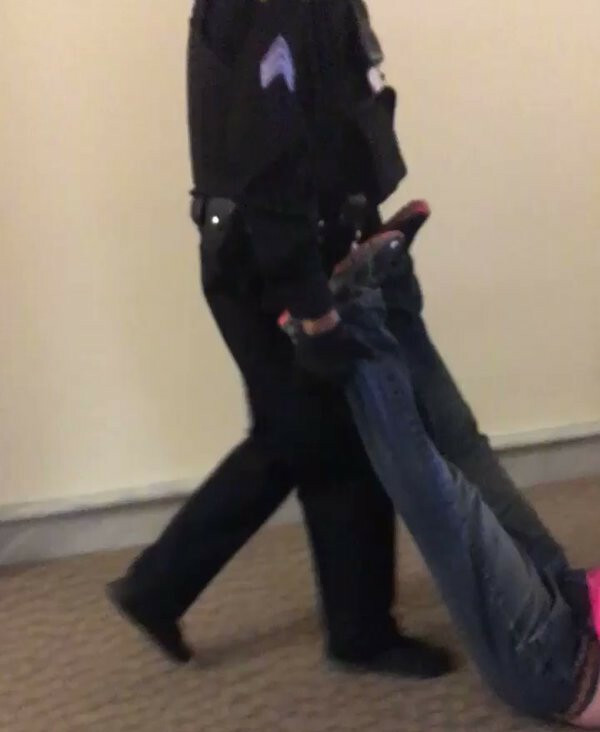 Video of half-hog tied protesters dragged from DC Council and lame excuses from both cops and councilmember Phil Mendelson.